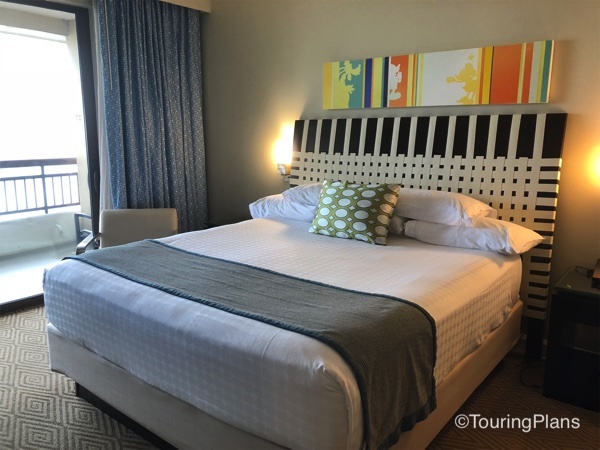 In today’s post, Len Testa, coauthor of The Unofficial Guide to Walt Disney World, shares with us his review of Bay Lake Tower at Disney’s Contemporary Resort. 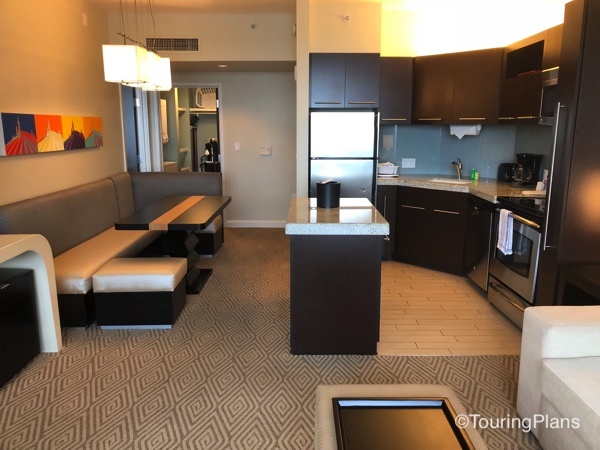 Opened in 2009, Bay Lake Tower is a 15-story, 295-unit DDV resort with studios and one- and two-bedroom villas, as well as two-story, three-bedroom Grand Villas with spectacular views of Bay Lake and the Magic Kingdom. 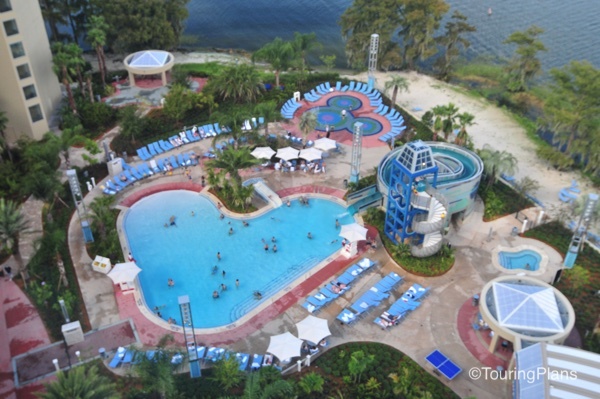 Laid out in a semicircle, Bay Lake Tower is connected to the Contemporary by an elevated, covered walkway and shares the main resort’s monorail service. The rooms are well appointed, with flat-panel TVs, DVD players, minifridges, microwaves, and coffeemakers. Brightly colored accessories, paintings, and accent walls complement an otherwise-neutral color scheme. Wood tables and granite countertops add a natural touch. Each room has a private balcony or patio. 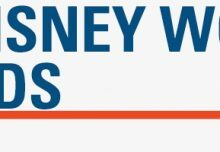 The rooms we’ve stayed in tested as the quietest on Disney property but average for lighting and bedding. Studios sleep up to four people and include one queen-size bed and one double sleeper sofa. The part of the studio with the bed, sofa, and TV measures about 170 square feet and feels small with just two people; four would be an adventure. A refurbishment of all studio rooms moved the bath’s sink from the kitchen to the bathroom. One-bedroom villas sleep five (the living room’s chair and sofa fold out to sleep three people) and provide a formal kitchen, a second bathroom, and a living room in addition to the studio bedroom. Two-bedroom villas sleep nine and include all of the kitchen amenities found in a one-bedroom, plus an extra bathroom. One of the baths is attached to a second bedroom with two queen beds or a queen bed plus a sleeper-size sofa. As with the one-bedrooms, a sofa bed and sleeper chair in the living room provide extra places to snooze, though they’re best suited for small children. Bathrooms in the two-bedroom villas are laid out a bit better than those in the one-bedrooms, with more room to move about. 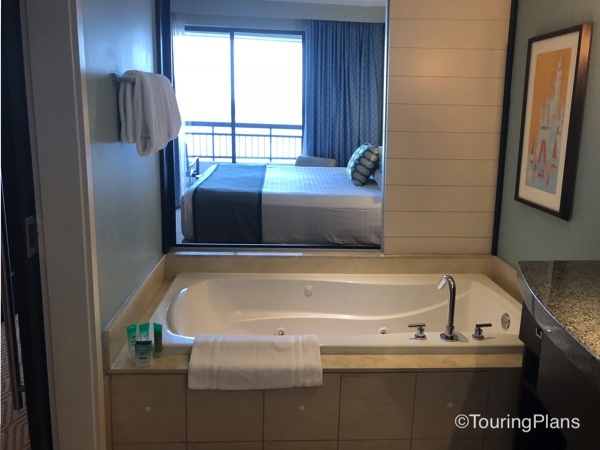 One odd feature in these (also found at other DVC resorts) is a folding door separating the tub from the master bedroom. Nevertheless, we think the two-bedroom villas are the best of Bay Lake Tower’s standard offerings. The two-story Grand Villas sleep 12 and include four bathrooms, the same master-bedroom layout, and two bedrooms with two queen beds apiece. An upstairs seating area overlooking the main floor provides a sleeper sofa and chair. 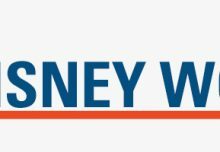 These rooms have two-story windows that offer unparalleled views of either Bay Lake or the Magic Kingdom—with unparalleled prices to match. Bay Lake Tower has its own check-in desk as well as its own private pool and pool bar, plus a small fire pit on the beach. 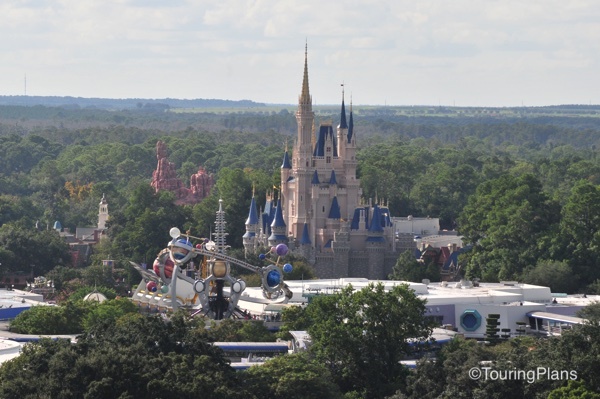 Its Top of the World Lounge is the best bar on Disney property but, alas, only for DVC owners. If need be, offer to buy a round of drinks in exchange for an invite. 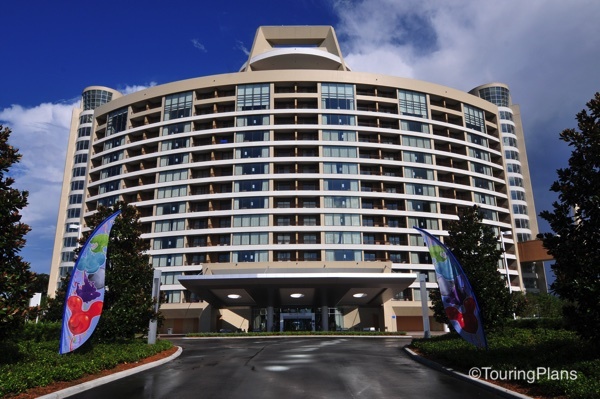 A 1-mile jogging path loops around Bay Lake Tower and the Contemporary’s Garden Wing. Dining, transportation, and other recreational activities are shared with the Contemporary Resort. 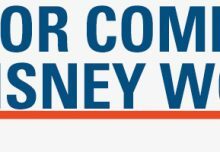 If you’re paying for a Magic Kingdom view, request a room on an upper level—above the seventh floor, at least—if you don’t want to look out on the parking lot.